I exaggerate. I’m not really going to tell you my password but I am going to tell you roughly how I created it. 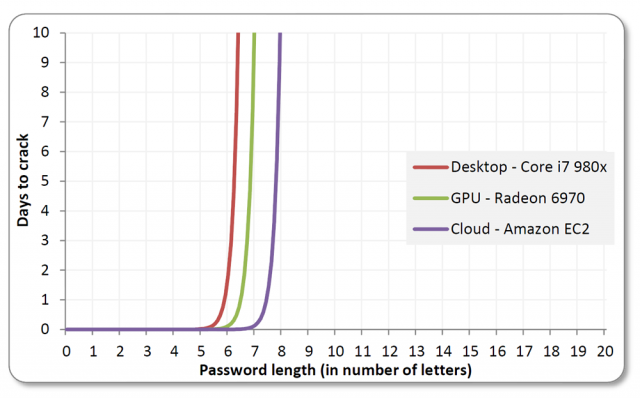 You may find it useful when thinking about your own passwords. Over the years I got into the habit of using the same weakish password for every website I registered on. This was OK for a while then one of the sites I use got its password hashes published and within a few days they were cracked and my password was there for all to see. The second design goal was the one which made my approach slightly different to other ones you see around. If you have multiple accounts on the site, each should have a different password. So your algorithm needs to take account of your identity too. The characters I have available on my Android phone are the lowercase letters a-z and the punctuation keys “,”, “.” and space. Your phone may be different. A word that's memorable to me, let's say "fart"
The consonants from the web site's domain name, padded out to a length of 4 by full stops. Some punctuation; a space followed by two commas. So my password is 17 characters long: not perfect but strong enough for today’s brute force attacks. It uses all the keyspace available without fiddling around on my phone’s keyboard. It’s unique for every account on every website (barring coincidences). It’s easy to remember. You can obviously vary these elements considerably to suit yourself. For instance you could use the last four letters in the website’s name, maybe reversed or something. Rearrange the elements I’ve used. This isn’t my actual algorithm, by the way. Just a little bit like it. Please don't tell me about the XKCD cartoon. I know about it. I'm not going to type in a 28-character password on my phone.